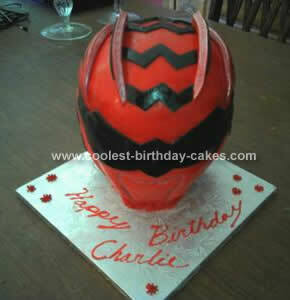 I made this Red Power Ranger Birthday Cake for my nieces 5 year old son. The bottom half of the cake is rice krispie treats for support, the top half of the cake is 3-10″ round vanilla sponges. After I carved the cake I used a butterscotch and banana filling. Once the cake was dirty iced with butter creme I covered in fondant and started adding the details.